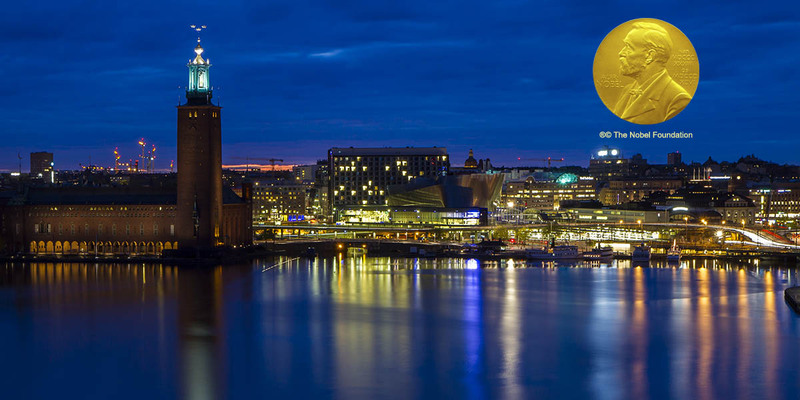 The Nobel Prize ceremony will be held in Stockholm, Sweden, on December 10. 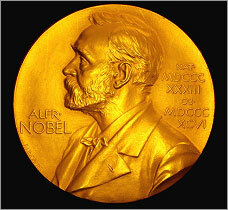 Photo © istock.com/Kristofferpettersson; Nobel Prize medal ® © Nobel Foundation. Most scientific progress stems from a team effort. 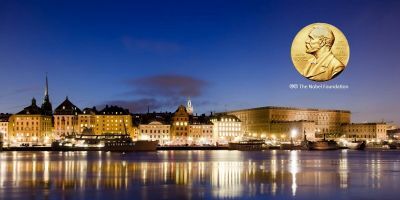 The Nobel Prize recognizes scientific achievements that have brought real and lasting change to health, the physical sciences, technology and economics and to our understanding of these fields. Each prize is awarded to up to three individuals, but the reality is that each breakthrough is the culmination of millions of hours of work conducted in labs around the world. Each award is only possible because of the community of researchers, reviewers and co-authors that enabled it. The formidable achievements recognized by the Nobel Foundation will, in turn, empower today’s scientists to make further discoveries. Thanks to their predecessors, who dedicated their time in pursuit of these truths, the winners listed below are finding new answers, reshaping human knowledge and tackling global crises. Most of the Nobel Laureates in science have published their work in Elsevier's journals and books — 183 out of 184 since the year 2000, according to a Scopus analysis — and many have served as editors, editorial board members or reviewers. At Elsevier, we are proud to support such scientific achievement. Many of our people began their careers in research, medicine or science, and they are passionate about working closely with people in the research community to support the great work they do and make it possible for researchers around the world to find it and build on it. To honor this year’s Nobel Laureates, their achievements, and the community that made these amazing breakthroughs possible, we have made a selection of their most cited papers published with Elsevier freely available. James P. Allison and Tasuku Honjo were jointly awarded the 2018 Nobel Prize in Physiology or Medicine “for their discovery of cancer therapy by inhibition of negative immune regulation.” A paper from Elsevier’s Cell Press (Nishimura et al, Immunity, 1999) was listed by the Nobel Committee as some of Prof. Honjo’s notable research on the topic. Their discovery and research on two specific immune cells has expanded the potential of cancer therapy treatments beyond today’s conventional methods, including surgery, chemotherapy and radiation treatments (some of which were honed by previous Nobel Laureates). This is not the first time the immune system has been used to stimulate a response to cancer cells; some of the earliest known concepts surrounding the use of the immune system to treat cancer were investigated in the late 19th century. While scientists sought to improve these early interventions, they also began to better understand how the immune system worked and its role in different treatment strategies. To use the analogy of an automobile with its gas pedal and hand brake, the immune systems antibodies, specifically the CTLA-4 and PD-1 proteins, could act either like a blockade, slowing an immune response down to allow for tighter controls, or could be sped up, accelerating the immune response. A new principle based on these early strategies began to take shape. As the body’s first line of defense against infection, disease and other bacteria, the immune system eradicates these intruders. A key component of its defense system are T cells, a type of white blood cell that can recognize intruders, including cancer cells. The ability to tell the immune system’s antibodies to attack specific cells, or to slow-down their response, like pumping the brake of a car, became the focus of our new Nobel Laureates’ research. In 1996, Prof. Allison and his team demonstrated that certain antibodies, in this instance the CTLA-4 protein, could be pointed towards the surface of certain T cells, acting as a brake. However, Prof. Allison had a different idea and had already set out to create an anti-CTLA-4 protein, thus removing the brake and unleashing the immune system on cancerous cells. Early indications showed that curing tumors in mice was possible. Prior to this in 1992, Prof. Honjo identified the PD-1 protein found on the surface of T cells in his laboratory at Kyoto University in Japan. It performed in much the same way as the CTLA-4, creating a blockade but with a different function. Its corresponding antibody, the anti-PD-1, was then developed and shown that it too could release the brake, allowing the immune system to accelerate its fight against cancer cells. 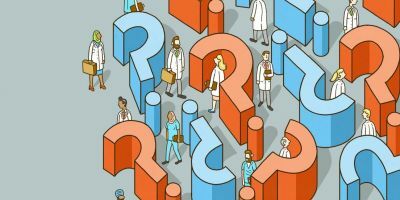 The treatment, now referred to as “immune checkpoint therapy,” has radically changed the outcome and survival rates of patients with certain types of cancer. And the work of professors Allison and Honjo was lauded by the Nobel Prize Committee as a landmark discovery in the fight against cancer. Prof. James P. Allison was born in Alice, Texas, USA in 1948. He was appointed a Professor of Immunology and made Director of the Cancer Research Center at University of California, Berkeley in 1985. He then relocated to New York City and became the Director of the Ludwig Centre for Cancer Immunotherapy at the Memorial Sloan-Kettering Cancer Center in 2004. He now lives in his home state of Texas. Prof. Allison has published in the following Elsevier journals: Biochemical and Biophysical Cell Research Communications, Cell, European Journal of Cancer, Genomics, Immunity, The Lancet Oncology, Trends in Immunology and Vaccine. He has also contributed chapters to the Elsevier book series Handbook of Cell Signaling. Prof. Honjo was born in 1942 in Kyoto, Japan, he received his medical doctorate in 1966 at Kyoto University, and completed his PhD in Medical Chemistry at the same institution, and currently serves on the Editorial Board of the Elsevier journal Current Opinion in Immunology. Prof. Honjo has also published in the following Elsevier journals: Biochemical and Biophysical Research Communications, Cancer Genetics, Cell, Cell Metabolism, Current Biology, Gene, Genomics, Immunity, Journal of Molecular Biology, Molecular Cell and Neuron. He has co-authored two Elsevier books: Current Topics in Developmental Biology and Molecular Biology of B Cells, and contributed chapters to The Vaccine Book: Second Edition. This is only the third time in history the Nobel Prize in Physics has been awarded to a woman. We need to celebrate woman physicists – because we are out there. … I’m honored to be one of those women. The invention of generating high-intensity, ultra-short optical pulses, by Mourou and Strickland, would be readily described as something coming out of a science fiction novel. However, the application of their research is common in homes and offices throughout the world. Lasers can be found pretty much everywhere, from their use in medical procedures, including eye surgery, to the welding of metals and glass and even the optical mouse that is attached to your computer. Laser light is created through a series of chain reactions whereby particles of light, called photons, create even more photons and are emitted in short bursts, or pulses. Since the laser’s invention in 1960, by American physicist Theodore Maiman, the power of lasers has grown exponentially. The technique pioneered by Mourou and Strickland built upon these earlier discoveries, and was highlighted in their 1985 co-authored paper, published in Elsevier’s Optics Communications. It had been discovered that amplifying the strength of such pulses was no longer possible without damaging the surrounding material. Their discovery, known as chirped pulse amplification, or CPA, was described by the Nobel Committee as an “elegant solution.” By taking a short laser pulse and stretching it in time over a great distance, the amplification of the laser could be increased (up to a point). But when squeezed back together, the laser’s peak power was found to be lower, resulting in its potential amplification being increased without causing further damage to the material that housed it. Their technique has become the standard for all high-intensity laser research and has opened exciting possibilities and applications in chemistry, medicine and physics, allowing for new precision machinery to be created for use in research and the everyday. A tool of light most accurately describes Prof. Arthur Ashkin’s contribution to the field of physics. His invention, known as optical tweezers, allows atoms and molecules to be plucked, pushed and pulled within their containment field without being damaged. 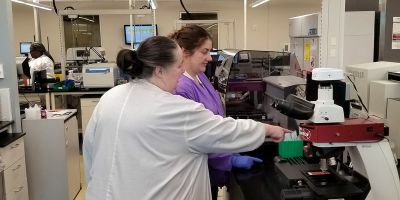 The tweezers’ application can also be extended to holding living cells, such as viruses and bacteria, allowing researchers to closely observe and control these organisms. The optical tweezer is not entirely dissimilar to a tractor beam in your favorite science fiction television show. Right around the time of the first laser’s invention, Prof. Ashkin set himself the goal of experimenting with light beams amplified by stimulated emission of radiation (LASER), to better understand how light waves move through space. After nearly two decades of experiments, Ashkin made his breakthrough in 1986 when he discovered the method for stopping and trapping atoms. In his attempts to slow down atoms, Ashkin made a second breakthrough, this time through the study of biological organisms and the possibility of their being controlled by his optical tweezers. He discovered that it was possible to hold these organisms, and reach inside them, but not destroy the outlying membrane of the cell. In today’s labs, optical tweezers have become standard equipment to observe and study the smallest particles, even separating healthy blood cells from infected ones. Prof. Arthur Ashkin was born in Brooklyn, New York in 1922. He received his PhD at Cornell University, following his earlier studies at Columbia University in New York City. Ashkin subsequently went on to work for Bell Labs where he worked on microwaves fields, before moving into laser research, where he not only developed his optical tweezers, but also studied photorefraction and non-linear optics in fibers. At 96 years of age, Prof. Ashkin is the oldest Nobel Prize winning Laureate, and he is the oldest Laurate currently alive. He continues to work in his home lab in New Jersey. Prof. Ashkin has published in the following Elsevier journals: Biophysical Journal, Fertility and Sterility and Optics Communications. Prof. Gérard Mourou was born in 1944 in Albertville, France. After obtaining his PhD from Paris VI Université in 1973 (formerly known as Pierre and Marie Curie University), he travelled to the US and become a professor at the University of Rochester, where at the time he supervised fellow Nobel Laureate Donna Strickland’s doctoral thesis; together they co-invented chirped pulse amplification. Prof. Mourou now resides in France and is involved in a pan-European initiative in laser technology. He is also leading the development of Extreme Light Infrastructure (ELI) that investigates light-matter interactions at the highest intensities and shortest timescales. Prof. Mourou has published in the following Elsevier journals: Acta Astronautica, Chemical Physics Letters, Journal Francais d'Ophtalmologie, Journal of Luminescence, Journal of Quantitative Spectroscopy and Radiative Transfer, Microelectronic Engineering, Nuclear Instruments and Methods in Physics Research, Section A, Optics Communications, Physics Letters A, Scripta Materialia, Solid State Electronics, Surface Science. Prof. Donna Strickland was born in Guelph, Ontario, Canada, in 1959. She is currently an Associate Professor at the University of Waterloo in the Physics and Astronomy Department. Strickland graduated with a Bachelor of Engineering from McMaster University in 1981, prior to pursuing her PhD in physics under the supervision of Dr. Mourou at the University of Rochester in 1989, where they jointly developed CPA, for which the pair were awarded this year’s prize. Strickland was also a former editor of Physics Reports. She describes herself as a “laser jock” after becoming the first woman in over 50 years to win the Nobel Prize in Physics. Prof. Strickland has published in the Elsevier journal Optics Communications. Frances H. Arnold, George P. Smith and Sir Gregory Winter were awarded the 2018 Nobel Prize in Chemistry "for harnessing the power of evolution." 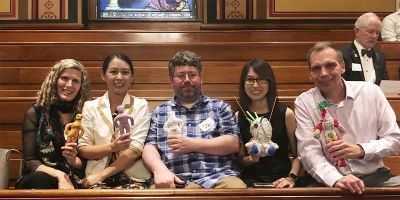 Half of this year’s prize was awarded to Prof. Arnold "for the directed evolution of enzymes," while the other half was jointly-shared between professors Smith and Winter "for the phage display of peptides and antibodies." Though their work was conducted on opposite sides of the United States and across the Atlantic in the UK, each of the Laureates has focused on microscopic proteins called enzymes. The direction of these enzymes' evolution has enabled the manufacturing of new antibodies used in therapeutic treatments for breast cancer, leukemia, asthma and many other autoimmune diseases that are still being developed in clinical trials. Prof. Arnold became only the fifth woman to win the Nobel Prize in Chemistry, and the first American woman in the Nobel Prizes' 117-year history. In the press conference, she said: "There are a lot of beautiful, elegant women in chemistry, and I predict we will see many more Nobel chemistry prizes for women." Prof. Arnold has published in the following Elsevier journals: Biochimica et Biophysica Acta (BBA), Biophysical Journal, Cell Chemical Biology, Chemical Engineering Science, Coordination Chemistry Reviews, Current Opinion in Biotechnology, Current Opinion in Chemical Biology, Current Opinion in Green and Sustainable Chemistry, Current Opinion in Structural Biology, Journal of Chromatography A, Journal of Inorganic Biochemistry, Tetrahedron, Trends in Biochemical Sciences, Trends in Biotechnology. She has also contributed a chapter to Comprehensive Organic Synthesis: Second Edition. Prof. George Smith was born in 1944 in the state of Connecticut. An alum of Harvard University, Prof. Smith was awarded his PhD in bacteriology from the institution, before joining the faculty of Missouri-Columbia (MC) in 1975. While on sabbatical during the 1984-85 academic year, he invented a method called phage display at Duke University, for which he was awarded this year’s Noble Prize in Chemistry. The process allows scientists to screen and harvest certain molecules. He holds the Curator’s Distinguished Professor Emeritus of Biological Sciences at MC, and is the university’s first faculty member to win a Nobel Prize. Prof. Smith has published in the following Elsevier journals: Analytical Biochemistry, Cell, Current Opinion in Biotechnology, Gene, Virology, Vaccine and Virology. Sir Gregory Winter of the UK, was born in the city of Leicester in 1951. Educated at Newcastle upon Tyne’s Royal Grammar School, Winter completed his formal education, graduating from Trinity College, at the University of Cambridge in 1973. He is listed as the founder of Cambridge Antibody Technology, a company credited with creating one of the most successful antibody drugs, D2E7. As Fellow of the Royal Society of Chemistry, Prof. Winter was recognized for his services to molecular biology and awarded a Knighthood in 2004. He continues to perform his at the Laboratory of Molecular Biology Cambridge and brings the total number of Nobel Laureates to work there to 12. Sir Winter has published in the following Elsevier journals: American Journal of Pathology, Analytical Biochemistry, Biochimie, Cell, Journal of Molecular Biology and The Lancet. 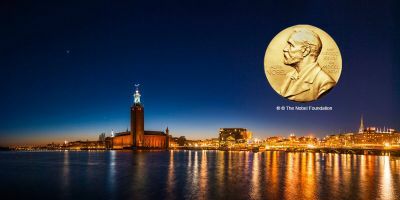 Marking its 50th anniversary, the Sveriges Riksbank Prize, more commonly known as the Nobel Prize in Economics, has been shared by two or more Nobel Laureates over 20 times in its relatively short history. Although they have not collaborated together, Profs. Nordhaus and Romer used the same theory in their research – the Solow Growth Model – and built upon its existing features. Recognized for his contributions 21 years earlier, Robert M. Solow explained many features of economic growth. However, his model was unable to identify the longterm differences in a developing countries’ income growth rate. This was something the theories of this year’s winners’ can address. These economic tools can help political leaders and policymakers tackle one of today’s biggest challenges: the impact of global warming. Highlighted in a 1993 article published in Elsevier’s Resource and Energy Economics, Prof. Nordhaus’s article “Rolling the 'DICE': an optimal transition path for controlling greenhouse gases” was one of his earliest examples of a dynamic integrated climate-economy (DICE). Subsequent versions of DICE have been used by policymakers to investigate alternative approaches to slowing climate change, namely through the application of carbon taxes. Prof. Nordhaus’s latest model, DICE-2016R2, presents four different scenarios, each applying a different carbon tax amount, and forecasts what can be expected over the long-term when emissions are cut thereby reducing the extent of climate change. For example, if carbon taxes were 6 to 8 times higher than today’s levels, drastic emission cuts could be achieved over a 25-year period (and maintained for much longer). His research shows how economic activity and policymaking (the creation and application of taxes) can interact with basic chemistry and physics (the carbon emissions) to slow climate change. For example, if the highest level taxes were applied, global warming temperatures could be kept from exceeding 2.5 degrees Celsius, according to his model. Having first identified the growth disparity between the fastest and slowest growing countries in the 1980s, Prof. Romer’s continued examination of income growth rates have made a huge impact on the field of economics. In today’s digital economy, Prof. Romer has taken the non-tangible, such as an idea for new goods and services – produced by new technologies – and shown how it can influence the market economy. Prof. Romer’s research on “ideas-driven growth” creates two distinct dimensions: the physical and human capital, known as rival (and non-rival) goods, and the level of excludability of these goods when certain regulations make these goods impossible to use by more than one person/organization (like a patent). As illustrated by the Nobel Prize Committee, if one were to take a Swedish meatball and eat it, then the level of excludability is 100 percent because no one else can enjoy that meatball. But in sharing Grandmother’s recipe to make the meatballs, there would be a much lower level of excludability because there is no limit to how many times such a recipe could be shared. Also by continuing to share such a recipe over and over again, the cost of reproduction would also be lowered. 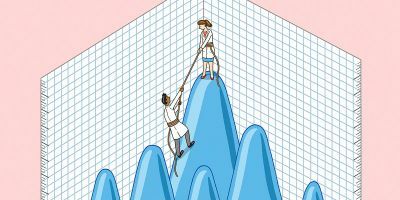 Prof. Romer has shown that such idea-driven growth, unlike the collection of physical and human capital, does not necessarily diminish over time – and more importantly, such growth can be sustained. 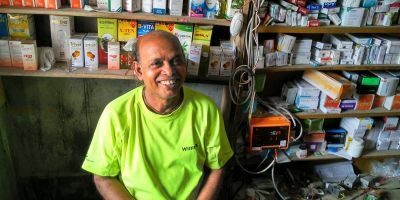 While we may still be actively looking for the answer to reduce climate change, this year’s Laureates have provided the means for society and its elected leaders to tackle perhaps the biggest issue that will affect the future of humanity. Prof. William Nordhaus was born in New Mexico, USA, in 1941. He received his BA and MA from Yale University, prior to being awarded his PhD from the Massachusetts Institute of Technology (MIT). Prof. Nordhaus has been a member of the Yale faculty since 1964 and has written extensively on the impact of climate change and global warming in the field of economics, for which he was awarded this year’s Nobel Prize, jointly-shared with Prof. Paul Romer. He currently serves on the Board of Advisors of Journal of Policy Modelingand was previously guest editor of a “Special Issue on The Economics of Technologies to Combat Global Warming” in the Elsevier journal Energy Economics in 2011. Prof. Nordhaus has published in the following Elsevier journals: Agricultural and Forest Meteorology, Carnegie-Rochester Conference Series on Public Policy (part of theJournal of Monetary Economics), Energy Economics, Energy Policy, European Economic Review, Journal of Comparative Economics and Resource and Energy Economics . Prof. Paul Romer, was born in Colorado, USA, in 1955. Since October 2016, while on leave from his current position as Professor at the Stern School of Business at New York University, Prof. Romer was Chief Economist and Senior Vice President of the World Bank until January 2018. He has thus influenced and made substantial contributions to the field of economic growth and monetary policy. Prof. Romer completed his graduate studies and was awarded his MA and PhD by the University of Chicago in 1977 and 1978 respectively. Prof. Romer was also active in the private sector; after leaving academia in 2001, he launched an educational technology company called Aplia. Their key product was an online experiment system presenting homework-style questions on subjects in the economic sciences. It was later acquired by Cengage Learning in 2007. Prof. Romer has published in the following Elsevier journals: Carnegie-Rochester Conference Series on Public Policy (part of the Journal of Monetary Economics), European Economic Review, Journal of Development Economics, Journal of Economic Theory and Journal of Monetary Economics. The following Elsevier colleagues contributed to this report: Alison Bert (New York), Marc Chahin (Amsterdam), Annis De Bruyn Moreira (Amsterdam), Jennie Eckilson (Cambridge, Massachusetts), Rachael Engels (Amsterdam), Ysabel Ermers (Amsterdam), Ian Evans (Oxford), Ian Smith (Oxford), Helene Hodak (Cambridge, Massachusetts), Frederik Adriaan Klinkenberg (Amsterdam), Emma McEwan (Amsterdam), Erik Rovers (Amsterdam), Matthew Smaldon (Oxford), Abby Sonnenfeldt (Cambridge, Massachusetts), Jose Stoop (Amsterdam), Anburaj Thangaraj (Chennai, India), and Alexandra Walker (Oxford), Jan Wilem Wijnen (Amsterdam). Jonathan Davis, MA (Publishing) is the Communications Officer for Elsevier in Amsterdam, and manages Elsevier’s Newsroom. He is no stranger to the business having got his start in the UK, first as Acqusitions Editor for a small academic publishing house in the Oxfordshire countryside, before joining Elsevier in 2013. His Canadian roots have now been planted in Netherlands’ largest city since the beginning of 2016. As a recovering news and radio reporter in a previous life, he can be found cycling through the Dutch countryside, and honing his turntable skills on the weekends.